Valentine Powder and Neapolitan Drizzle. Heart Donut was a close third, however. Cocoa Powder, Pumpkin Pie Filling, and Fudge Swirl Drizzle. Chocolate is, if not my top, one of my all-time favorite ingredients, and as I've mentioned before, pumpkin pie is underrated. Mint Cream Filling. I adore the sweet, cool flavor of mint, and anything creamy is delightful. I'm so sorry, I'll have to do this later! The game is lagging seriously right now, moving at perhaps 3fps. Long wait? Nah, it's fine. I was actually thinking I was making you wait! I thought you might've given my order and I hadn't graded it. But now I know that's not true. I always take in consideration of time constraints in my scores. You're totally fine! I really appreciate your patience. Sorry for the long wait, Aceticke! I'll have to wait a bit until I have access to my computer, but I didn't check this place yesterday because I had bad headaches all day, and looking at a device made me feel sicker than usual. Geez, one bad day of headaches can cause you to miss out on so much. I don't mean to rub it in, but as I read along to catch up, I was beginning to see where Totes was seeming a little suspicious. It's too bad we lost our real Seer and who may have been our Necromancer, but we're already 2 wolves down! 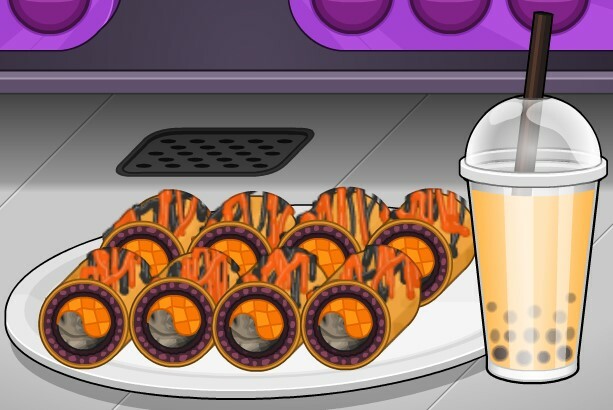 So now I'll order a Halloween-themed sushi: orange and black. Use whichever ingredients you desire to create this effect; they don't need to be holiday ingredients. Pumpkin pie is seriously underrated. Anyway, I voted Pumpkin Filling, Chocolate Acorn, and Harvest Leaf Cookies. The latter remind me, in concept, of these maple leaf cookies I get every autumn from Trader Joe's. They have maple-flavored cream sandwiched in between two cookies designed like leaves, and they're awesome. I agree. I wonder what it tastes like. It may just be regular whipped cream dyed with orange food coloring. I don't know what flavors would work for giving it a unique, Halloween taste. I'd consider candy corn if that weren't already an ingredient.